On May 11 and 12, 2017 will be the 2nd Meeting Women & Philosophy. 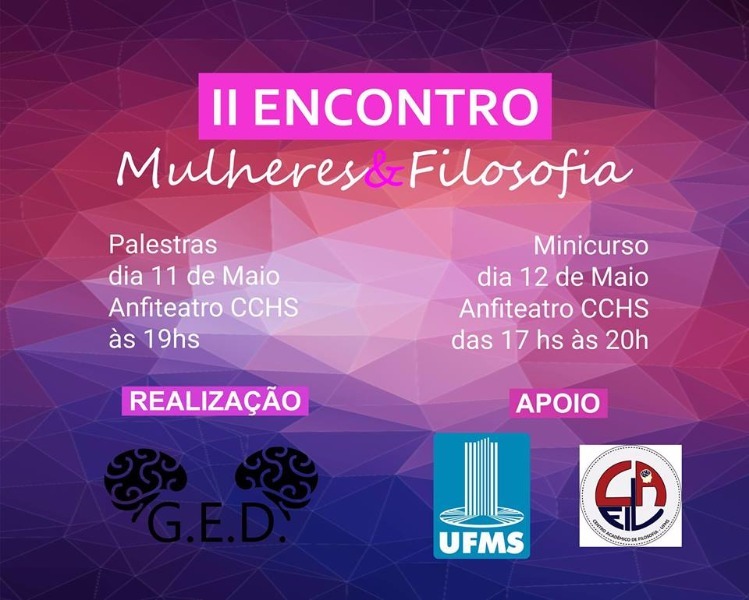 The meeting is an achievement of the G.E.D - Group of Democratic Studies, coordinated by the PhD Professor of the Philosophy of UFMS, Marta Nunes da Costa and organized by students of the Philosophy course who participate in the same group of studies. "Critique of a materialist conception of history? Brief essay on freedom. " "Surveillance devices and the role of feminist critique"
The mini-course proposes the discussion on the issue of surveillance of electronic devices, the use of technology and technologies in a critical sense, in line with feminist perspectives. We know of the militant use of social networks that favored renewing political reactions and the empowerment of feminist collectives that created new articulations, means of discussion and activism. Making it necessary at this moment to reflect on the vigilance that seeks to dominate these actions, interfering in an indirect and anodyne way in the law and political organizations that have formed from a few years to here. The discussion will be permeated by concepts discussed in the book Feminist Surveillance Studies (Dubrovsky / Magnet - Organizers) and recent or remote filmography about the surveillance problem, with reference to two films: 198 4 and V of revenge, and episodes of Black Mirror series. We will discuss, above all, the ambiguity of technique in its mechanisms of oppression and reaction.